Wheelchair accidents are often the result of poor supervision, taking inadequate safety measures or poor training, and the majority of them can be prevented. The nursing home injury attorneys of Nursing Home Law Center LLC are committed to raising awareness to nursing care concerns and to ensuring that the victims of negligence and abuse receive every bit of compensation they are entitled to. If you or your loved one was injured in a wheelchair accident, you may be able to recover compensation for the cost of your medical care, the value of your pain and suffering and the cost of any out of pocket expenses. If your family member suffered an injury or death as a result of an accident involving a wheelchair in a nursing home, you may have ground to file a lawsuit against the facility. Complete the case intake form and an attorney will reach out to you shortly. Lack of supervision and the failure to follow proper safety procedures are factors in a lot of the wheelchair accidents that our Chicago nursing home injury lawyers respond to. Many people fail to recognize just how dangerous wheelchairs can be if they are not used in a proper manner or if patients are left in them unattended. Here are some of the common causes of these accidents. Failure to use brakes — the rule of thumb when supervising any patient in a wheelchair is that the brakes should be applied whenever the wheelchair is not in motion. This is especially true when the wheelchair is located on an incline or when the patient is being assisted into our out of the chair. It is far too easy for the chair to begin to roll when the brakes are not applied, resulting in the chair running away from the caregiver or the patient falling when attempting to sit or stand. Improper securement in vehicles — when placing a wheelchair into a vehicle that is designed to accommodate wheelchair passengers, it is important that the caregiver makes sure that the patient is secured properly so that he or she will not be thrown from the chair when the vehicle hits a bump in the road or the driver is required to brake quickly. Patient falls when sitting or standing — even if the wheelchair has been secured, it is possible for whoever is assisting the patient not to properly secure or assist him or her when he or she is sitting down or standing up. Limbs are caught in the moving parts of the chair — if the patient’s legs and feet are not properly secured, it is possible for them to drag or be pulled under the wheels or dragged under the wheelchair. When this occurs, serious injuries such as broken bones and lacerations may occur. The wheelchair strikes an object — wheelchairs should never be pushed forward through doors or up hills because it is possible for a closing door to hit the patient’s feet or for his or her feet to contact the ground when being pushed up a steep hill. The patient is injured when left unattended — there is simply no reason or excuse for leaving a patient in a wheelchair without supervision when considering all of the things that can go wrong. Patients that are confined to wheelchairs are already dealing with limited mobility and these accidents can add insult to injury by exacerbating the conditions that resulted in the need for the wheelchair. Injuries can include broken or shattered bones, cuts and lacerations, internal injuries suffered during a fall, traumatic brain injuries and more. Elderly patients are far more likely to suffer from broken bones at their advanced age, and many are taking medications which make external and internal bleeding much more severe than it would be otherwise. When these injuries further limit the patient’s mobility, they may also experience the following. The development of pressure ulcers due to the inability to move for long periods of time. These sores can be extremely painful and become infected. Complications due to internal bleeding or the perforation of organs. These complications are compounded when the patient is taking blood-thinning medications for the treatment of heart disease. The development and spread of infections. Even internal wounds present the risk of a bacterial infection. An infection can greatly complicate a patient’s recovery and prolong his or her suffering. A diminished quality of life and decreased longevity. Studies have shown an alarming link between hip fractures and a shortened life span and this can be true of any injury that impacts mobility and independence. The physical and psychological impacts of further impairment can increase stress levels and the risk that the patient will suffer from related complications. Blunt trauma injuries. Especially in the event of a runaway wheelchair, it is possible for the patient to suffer blunt trauma at the moment the wheelchair collides with another object. These injuries can be life threatening depending on their location and severity. Traumatic brain injuries. If the patient strikes his or her head, it is possible that the resulting injuries could impact cognitive function and his or her motor skills due to damage caused by internal swelling within the brain. While wheelchair accidents are never planned, they are often the result of negligence. The decision not to apply the brake, failure to properly secure a passenger or the choice to leave a patient unattended can mark the difference between a nonevent and catastrophic injury. It is for this reason that the caregiver and nursing facility can be held liable whenever such irresponsibility results in needless injury or death. 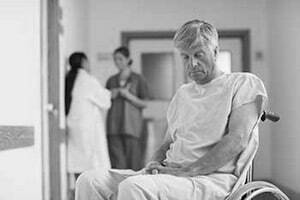 Nursing Home Law Center LLC can help you if you or a loved one has suffered an injury due to negligent nursing care. Our firm has represented thousands of clients across the country whose injuries were the result of another person’s negligence and our track record of success has provided us with the experience needed to ensure you with the greatest chance of recovering the maximum amount of compensation to which you are entitled. In addition to providing award-winning legal services, we have access to the medical specialists and experts needed to help you or your loved one through his or her recovery. Contact us today to arrange your risk-free consultation with one of our nursing home injury attorneys so that we can gather the information we need to get to work on your behalf. Once we have been able to evaluate your case, we can let you know more about your rights and legal options so that you know what you can expect. Our attorneys work solely on a contingency basis, so you are also assured that you will never be required to pay for our services if we fail to secure compensation on your behalf.